Well...here we have "hump" day..... As I sit looking at my blogs this morning... (I read Lisa Bongean's, With thy Needle & Thread, Heartspun Quilts, Moda Lissa, Kansas Troubles Quilters, Marcus Fabrics Blog, Jeanne's Blog Country Sampler, Moda...the Cutting Table) I feel like I'm right at home with my friends! Do you read more than my blog? How many do you all read? I know there are some gals that could sit all day and read blogs...isn't it amazing how interesting people are? I just love seeing what they are up to, designing, great tips, yummy recipes...when does it all end? Well, that's just it... it doesn't end until we "click" the "off" button!! Right?! Knowledge is always out there and it's yours for the taking! Here is what "knowledge" I found for you today! I thought these were pretty interesting. 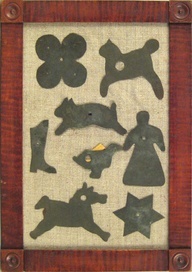 They were labeled as metal quilt shapes for an applique quilt - 19th century. At first I thought they were cookie cutters...but they are flat..easy for tracing around! 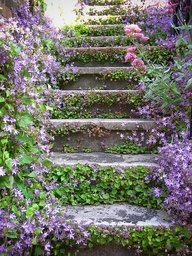 How wonderful are they? Now... 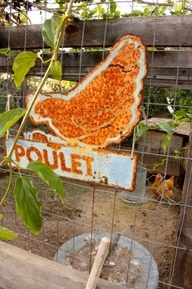 I don't know about the rest of you... but I WANT THIS POULET SIGN!!! Oh Yes I Do!! I know right where I would hang it in my kitchen. Dang...why do they have to temp us with pictures like this...gggggrrrrr.... I love it! I'll bet if I found someone to do reproductions of this sweet little gal I could sell a ton of them! Now... friends...let's talk... SUGAR HIGH!!! 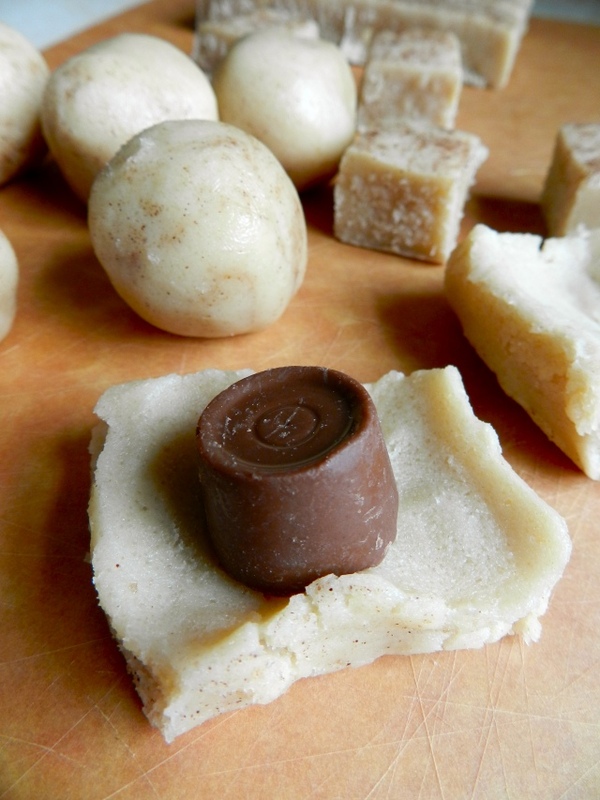 These are snicker doodles wrapped around a Rolo! Can you spell - Yumalicious? !!!! Now this is what I call a sled! I've never seen one shaped like a tree before. 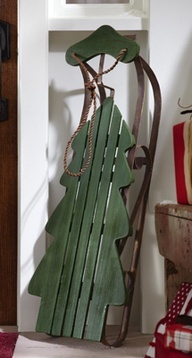 How cute would this be displayed at your front door for the Holidays. Tie it down... it may decide to go for a sled ride and you'll never see it again!!! Very nice! Vignettes - I just love them... AND love to make them. 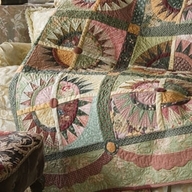 Here we have a sweet patch quilt on our table...then a wonderful wooden box (I love wooden boxes too!) - nice and flat so we can display great things in side. 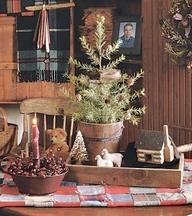 These little potted trees are great for all year long.. we sold hundreds and hundreds of them at the OGC....they are just timeless. Then they've added a sweet little log cabin, two tiny sheep and a bottle brush tree (another love of mine). I would have simply stopped there... it's all complete and has an odd number of items (odd number gives you a rounded display). Isn't it wonderful? You too can make this... give it a try!! Let's see what you can come up with...by just taking things from around your house and moving them into different displays. It's so much fun! I love doing it! Here is something else I think is a great idea. 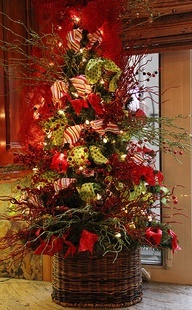 They have taken a Christmas tree and placed it in a large woven basket. This could have been a hamper...don't know for sure... but I think it's stunning! I've also seen trees sitting inside wonderful old crates and trunks!! 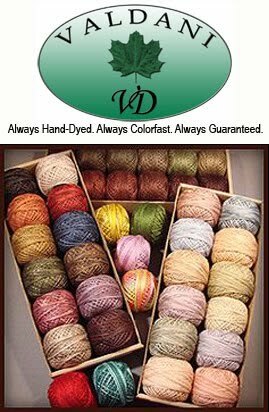 Do you have a trunk in your home? Have you thought about sitting your tree inside the trunk? How cool would that be! 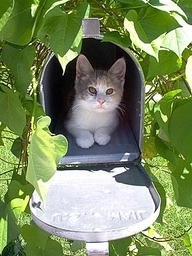 And here's our little kitty.... wishing you a happy Wednesday... while playing and hiding in the mailbox. Wow... that would scare the pants off the mailman wouldn't it? Guess who I saw the other day? It was my old FedEx delivery fellow!!! Yep... he delivered a box to the house and it was good to see him! Cute as a button...just like I remembered. Those guys (and UPS) sure work hard! Have a great HUMP DAY!!! !